In an earlier blog post we showed you how to create Lofted Terrain. In this post we demonstrate some terrain variations on this technique. We cover all these methods in our Autocad 3D training courses. Firstly copy the terrain to one side. Note that if the original splines are too close to each other it can give the appearance of boulders emerging from the ground. This is simply due to how the Normals (faces) are created. In such a case, we can change from a Smooth Fit to a Ruled Fit, as follows. Right-click on the object and open up Properties. In the Geometry section choose Surface Normals, Ruled. This results in a linear loft from one curve to the next, and if you have sufficient contours you’ll not even notice it on a 3D model. In fact terrain models are often created from flat surfaces (or alternatively from interpolation points). Note that overhangs do not make good geometry and will slow down your computer. They may not even print at all. But, in a way, that’s a plus for us, because it’s a good warning. If it’s hard to calculate mathematically in Autocad this means that it would be hard to build in real life, and we’d be advised to tidy up our design. First select the surface. Next open the Solid Editing tab and choose the Thicken tool. Alternatively you can type thicken. Specify 200mm as the thickness – note that it doesn’t need to be too thick. The object is now a 3D solid rather than a thin mesh object resembling cardboard. Now go into Wireframe mode and choose the Extrude tool. Select the property line and extrude upwards by a large amount, eg.20m. Now move it down in the Z-axis so it intersects the contours. We now want to use the terrain to cut into the box, so select the Subtract tool and select the box object first, and hit Enter. Next select the terrain object and hit Enter (ie. select the main object first, then the cutting object). Note that if the original object disappeared change the DELOBJ system variable value, and try again. Now return to the Solid Editing tab and choose the Separate tool. Clicking on the box object results in a separation of the solid into two independent pieces. 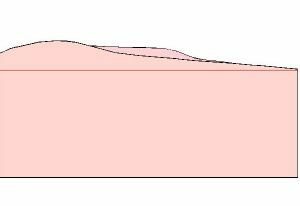 Use the Erase tool to click on the top half of the box, followed by the remaining contour shape, to reveal the topography of the site. Alternately you can erase the contour first, then Separate and delete the top half. Next we can put buildings or objects onto this terrain site. If you encounter any problems, simply switch to a Ruled surface. You may now go into a Paper layout to create a sectional view. The 3D interface in Autocad is user-friendly and easy to learn, and we take time to teach a wide range of techniques in our classes, which include modeling, materials, lighting and animation. You can see many examples of our class work on our Facebook page. For more information there are lots of resources on the web, but try the Autodesk site to begin with: www.autodesk.com. Support options and user forums are also available from the home page.